As part of JUMP’s ongoing initiative to reach out to those who have served in Japan, our very own Suzy Wagner sat down with SGM Brenda J. Kadet to gather her perspectives on her time abroad. Had you been looking forward to going to Japan? When I was assigned to go there, I didn’t even know that we had forces in Japan. I was Command Sergeant Major for the 78th signal battalion in Camp Zama, near Tokyo for 3 years from July 2004 – July 2007. We were responsible for all computer and network operations. It was an amazing experience. I would love to go back. What would you tell Japan-destined service members not to miss? Take advantage of every 4-day holiday that you can and travel around Japan and the region. The Army and American Forces offer a lot of great travel opportunities. Take your children to Tokyo Disney. Travel around the region. Visit the Great Wall of China. Go to Australia. Don’t put it off. We saw Hiroshima, we traveled a lot and got to experience the country. The Japanese people are the most amazing people, gracious, helpful and welcoming. You’ve got to throw yourself out there to experience the culture. You can’t experience a lot of that on base. The first thing that blew my mind was how small the roads were. First, you need to learn to drive on the opposite side of the road, which is a little more challenging if you’re in an American car with steering wheel on the left. There are some tight, tight roads. Not only are your driving down these itty-bitty roads, but you’ve got navigate these 1½ lane wide roads with pedestrians, bicycles, cars. It took me 6 months to feel comfortable in driving off post. What else? Was there something that you didn’t know before you got there? The Karaoke is HUGE in Japan. Going to a karaoke bar and singing with co-workers or friends is part of the experience. It’s very popular in Japan. Everyone gets up and sings. Also, in Japan, they reuse everything. There are recycle shops where you can go and buy dishes and items in boxes. You’d think that it was brand new. When you go over you need to experience it. You went to Japan with a young son, what was that like? We got to Japan before his first birthday and were there until after he turned 4. The Japanese treated my little blonde haired boy like a prince. People would stop us and ask to take pictures of him. When we first got to Japan, my husband didn’t have a job. We let my son Nicholas model a little bit. His picture appeared in some magazines. My son is now 11 and thinks that he’s still famous in Japan. As a young mother, what was your biggest challenge being abroad? 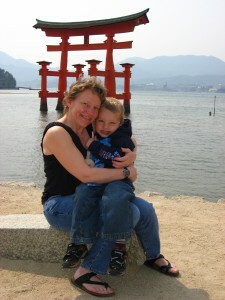 My son who went through his terrible two’s and three’s in Japan. I remember coming back to the office and telling my coworkers that Nicholas threw a tantrum on the train and I didn’t know what to say or enough Japanese to apologize for his “ugly American” behavior. When you’re there, everything that you do reflects on you as a solider and you as an American. And, you want to make a good impression and leave them with a good impression. Your behavior affects Japanese attitudes. That would really stress me out. The Japanese are amazing people. In the daycare/child development system was really good. He learned a lot of Japanese while we were there. In fact, he speaks more Japanese than I do. It was also incredibly safe. In the U.S., we don’t let our kids out of our site. My son could get lost in the middle of a huge department store in Japan and I would get him back. Leaving Japan made me nervous. There’s so much crime [in the US]. I didn’t want to come back. What was the most unusual food? I enjoyed the food. Although, at one event, one of the menu items was “lightly roasted chicken.” We cut into it and it was raw inside. The outer part looked cooked. Maybe salmonella isn’t an issue in Japan, but I wasn’t going to try it. There are some all-you-can-eat-places with a grill in front of you and you cook your food on your table. It’s important to take what you like, because to prevent waste, they charge you for everything that you take. There’s no waste in Japan, in America, we waste away. You’ve done 350 jumps out of airplanes, you’ve pushed yourself physically and mentally, what drives you? We did training in Japan. I was the senior enlisted person in the unit. I was the oldest and at 4’ 11”, I was the smallest in the unit. If I could do it, there was really no excuse for anyone in the training. Anyone can do it. It’s about finding your motivation, reaching down and doing it. What’s next? I’m right around 32 years. I’d love to serve again. If I’m lucky to serve again, I’d love to serve in another oversees role. Next August, I’m due to rotate into my next job otherwise, I’ll retire. You can’t stay forever. I still don’t know what I want to do when I grow up. The army is all that I’ve done for so many years. I love what I do. The army life has challenges, but the challenges are worth the reward that comes with it.